the evening the breezes from the shoreline sweep down off the hills cooling the valleys below. Daytime temperatures hover at around 29 C and in the evening we may go as low as 24 C which is wonderful for sleeping especially when there is a breeze. It appears now that the easterly trade winds may have returned. The last few days we’ve had winds of over 15 knots with higher gusts bringing the rain. In some ways the rain is a blessing. It does rain a lot here and we’ve managed to only once gather water from shoreline resources but apart from that one time we’ve collected rainwater on tarps and awnings so that both drinking and bathing water has been fully replenished. In fact as I sit here we’ve rolled up our collection system as the tanks and containers are full and until we consume a little we don’t really need any. Nice in one way but also here there’s so much rain that things are going mouldy and we’re having to take curtains down to wash them and store away until we get some sunshine. We keep the fans going in the boat day and night just to keep the air circulating to dry and fend off the mould bugs! We’re winning. 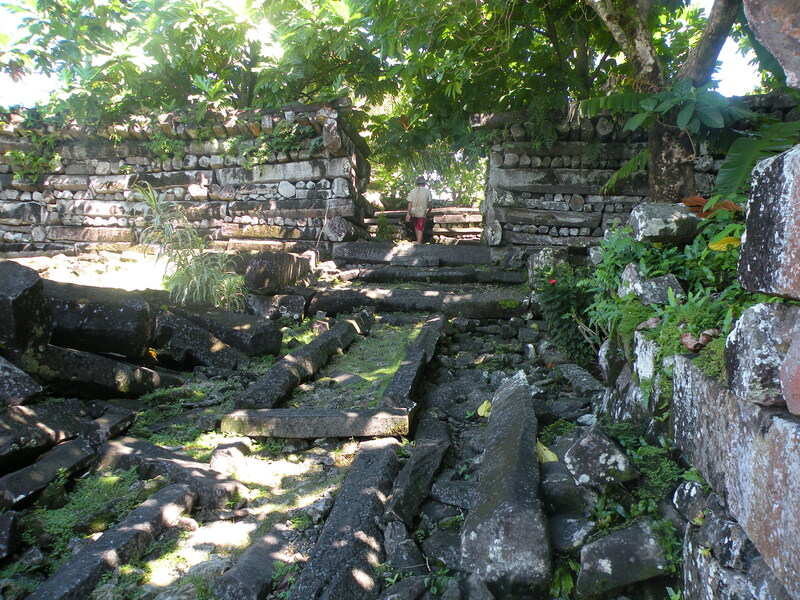 was built by a conquering group who came to Pohnpei 2,000 years ago quickly subduing the local population and forced them to build an incredible fortified community on the east coast of Pohnpei. 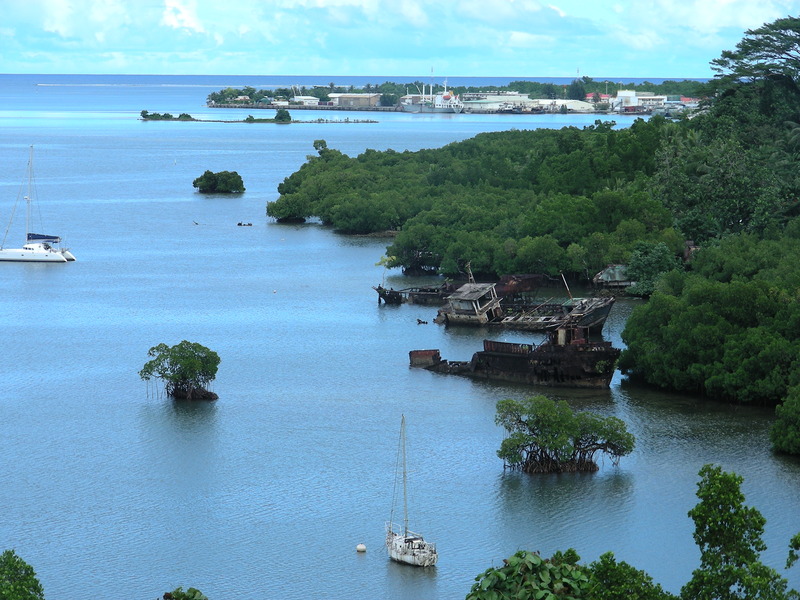 The rocks used to build Pohnpei were brought from Sokehs Island which is very close to Kolonia some 15 miles from Nan Modol. The intricate forming of the stone blocks is stunning to see. Some blocks are square and others almost hexagonal and both types used in the construction of the walls. Today we were led out to Nan Modol through the mangroves. Our timing was bad as we arrived at high water and had to wade over to the main section of Nan Modol. That was a shock to the 15 year old guide we had as she had to sit through crazy white people stripping down to carry their clothes over to the opposite shoreline. Am sure the SDAers, or the LMSers, or the Church of Latter Day Saints would not have been impressed with our actions. However, having hiked all the way out there we weren’t going to miss out on strolling through the ruins. We had a great day heading out to Nan Modol with a couple of other cruisers in a rented car. It was our first foray out of the anchorage on the town of Kolonia. We took great advantage of stopping at every little nook and cranny, every store, every waterfall and at a very nice resort called the Village Hotel. First off were two waterfalls. 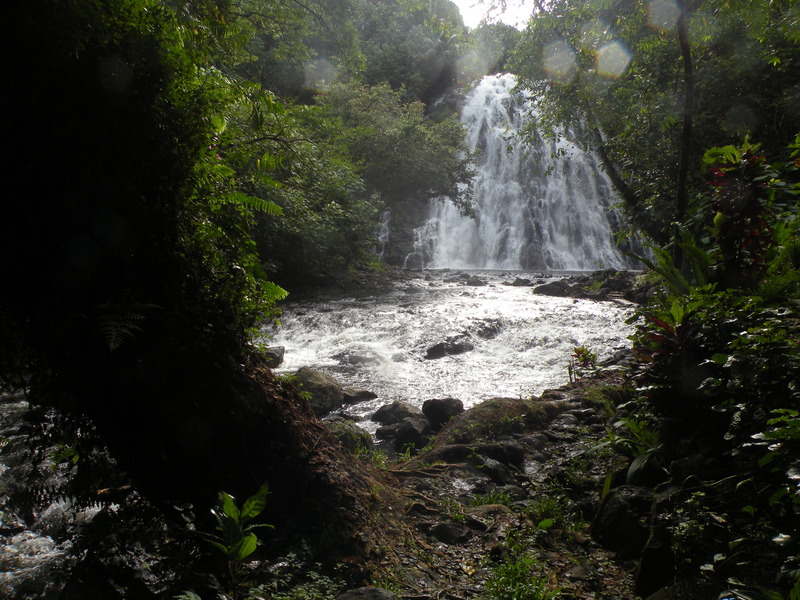 The first hike we made was a treacherous walk into the bush and along a ridge under an overhang from which the waterfall cascaded. It was a spectacular site but not the best waterfall to bathe under. The next was a short hike along a beautifully designed walkway planted on other side with giant crotons, ferns, hibiscus and palms. Due to easier access it’s definitely the more frequently visited by tourists. However, to be honest there are very few tourists here and most coming here focused on surfing and/or diving. The waterfall was a welcome relief to escape from the heat and humidity. Time was calling. We had to head back to town but not before a stop at the Village Hotel for a bite to eat and a lazy hour spent being pampered by an incredible setting and great service at the Village Hotel. 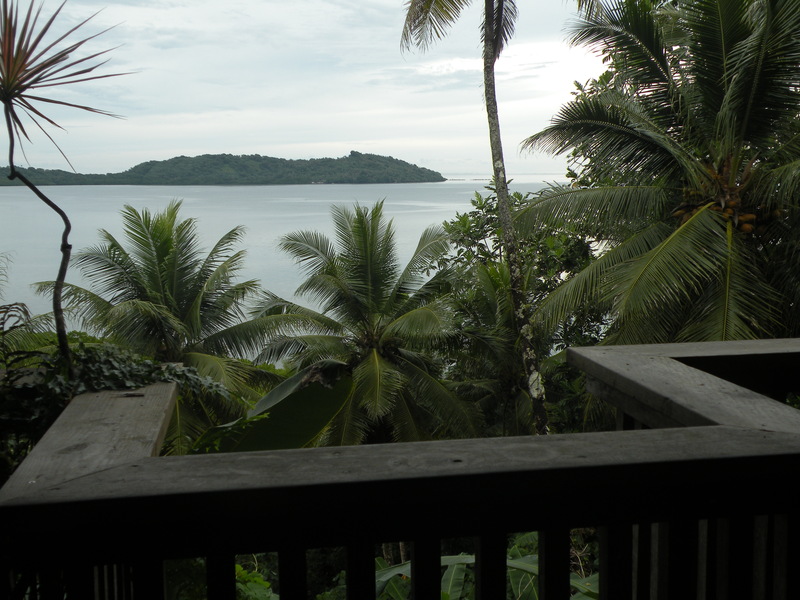 The Village Hotel is probably the best resort in Pohnpei with a traditionally built main lodge perched high up on a ridge offering an incredible view over Manta Pass. From there one can watch either the sunset or the sunrise transforming the ocean into brilliant array of colours and moods. It’s probably the best place in Pohnpei for food and view. We’re very lucky it’s 8 km from town or otherwise we may be broke by the end of the month. Have a wonderful sail to Palau! Hi Tony and Connie, Glad to hear all is going well and the adventure continues apace! Getting cool over here but no snow yet other than in the mountains where it belongs. Just finished reading a rather jaded view of the S. Pacific islands by Paul Theroux entitled the “Happy Isles of Oceania”. The stonework used in the fortress at Nan Modol looks like naturally formed volcanic rock which sometimes forms into hexagonal shapes. Have a safe crossing to Palau and a Merry Christmas and a Happy New Year to you both. Wishing you a merry Xmas and great New Year from Puerto Morelos, Mx. Ran into Sierd yesterday! Which reminded me to check your blog – too late….. I’m now subscribed for updates. Wishing you all the best in sailing to Palau. Happy holidays from our gang to yours!